Affiliate Links: If you click on a link in this post, I may make a very small commission. I purchased the items featured in this post. 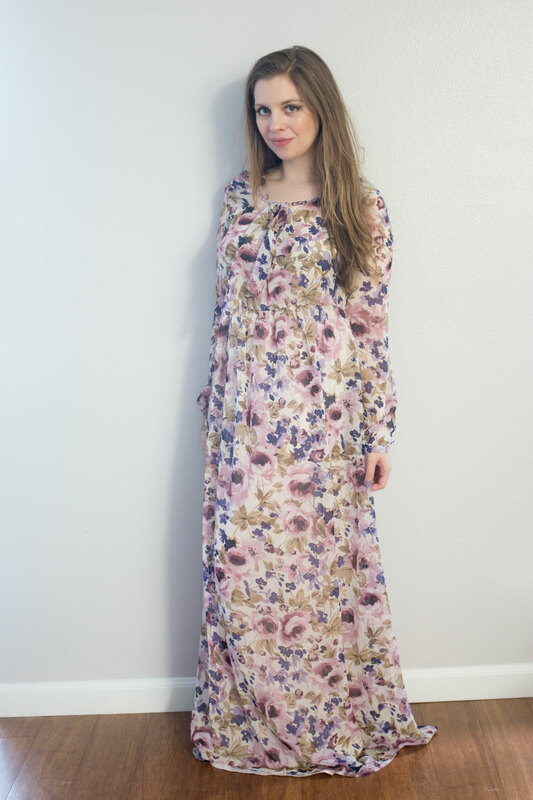 In all my posts on blogging, this is the first time I’ve ever purchased pieces from a collection and tried them on at home for the purpose of the blog. Well, let’s be honest, it’s mostly to quell my own curiosity. I don’t think it’s a big secret that I’m a fan of Lauren Conrad. And when it comes to fashion, I love her budget-friendly line at Kohl’s, LC Lauren Conrad. This year she showed her very first collection at New York Fashion Week and live streamed it on Periscope. Then immediately following the show, the collection was available for purchase at Kohls.com. Obviously I jumped right on that, and my items arrived last week. I photographed me trying everything on this weekend and thought I’d give you my honest review and fit details on each piece I was interested in from the collection. I’d love to hear your thoughts if you purchased anything from her collection too! I think this is pretty cute and was pleased overall with the fit. The quality of the fringe, however, leaves something to be desired. The fringey bits are looped, so they get stuck on everything, including the fasteners for this top. It’s just too high maintenance for me to be honest. This is seriously cute, but not quite cut out for those blessed in the chest. (Or in my case, annoyed by it. :P) You can see the gaping at the arm pit area on my left arm, and it bunches a bit below my bra line. Adorable, but unfortunately not for me. From the photos online, I didn’t realize there was a second layer of lace under the collar. It’s quite a cute top, and I do like it, but I wonder if I need to keep this, ya know? Love the bell sleeves, and the fit of this was spot on. However, I felt like a bride. I think this would be adorable for a bride-to-be to wear to her bridal shower, bachelorette party, etc. Maybe I’m just not that into white? Or maybe it’s just the neckline. Either way, it’s cute but not totally my style. I like the overall idea of this, but the top was cut too boxy for how I would like to wear it (under skirts, tucked-into pants, etc.) As you can see, it suffers from the unfortunate sag of extra fabric at the waist. The trim on the sleeves, though… so cute. I love this top, especially now that I’ve seen it in photos (it’s the neckline, honestly.) However, this has absolutely no give, and you can see the pleats gaping at the bust line. I’d recommend sizing up if you might run into the same issue, so I will be trying this in a medium. Love this in theory…. however for us shorties, I think there’s just too much material happening. For a taller person, this would be beautiful, and I love the peasant sleeves and the tie neck detail. I also found the material on this to just be so-so and on the cheap side, so I might hold out for a bigger price drop. Eek, the fit on these jackets were smaller than I expected… but I should have known better. Apparently I normally size up in jackets by Lauren Conrad because I own a size 6 blazer. Oops. Strangely enough, I did find the violet (or blush/beige, which is what it looks more like in real life) jacket to run a teensy bit larger. This definitely runs smaller in the shoulders and chest, so if you typically need to size up in those areas, I recommend doing so. I feel like a tease now that this color has sold out online, but in case you were curious, here’s what it looks like for comparison to the Hushed Violet version. If you can find this in your local Kohl’s, I recommend giving it a try. 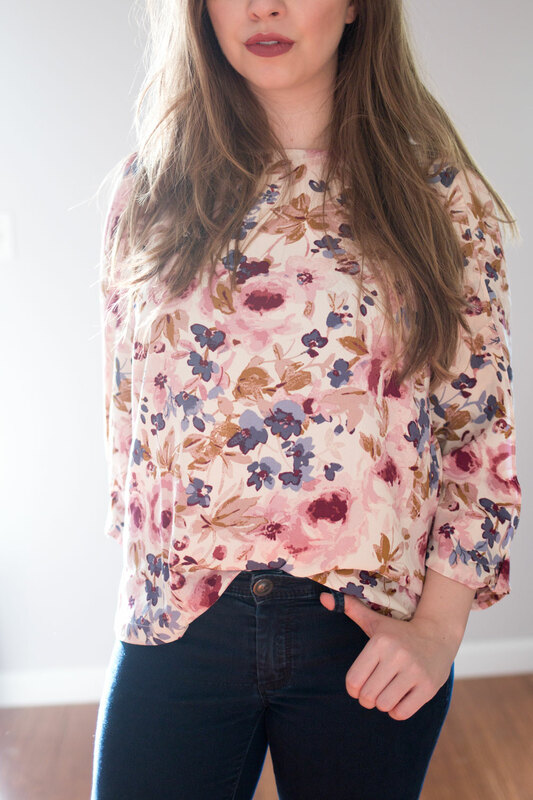 Love the colors of this top, how cute would this look with a button front corduroy skirt in oxblood or brown?! The fit of this is true to size, and I’d even say it’s cut generously since it does have a more boxy fit. I hope that if you were interested in this collection this was helpful! I always have difficulty judging how things will fit on my body versus the super tall models walking the runway, so I always like to see things on someone a bit more my size. If you’re interested in any of the pieces, be sure to use code “LEAVES” which will give you 20% off and free shipping on $75+. Which pieces from the collection do you like? Are there ay collections coming up you’d like to see a shopping guide/try on for? i’m with kelsey – i wear LC every day, but i got most of it on the sale rack. THESE THINGS ARE SO CUTE THOUGH. the owl romper… PERFECT. Wow, what an awesome deal! Ha, I definitely think you’ll be seeing a lot of theses pieces on the sale rack in a couple of months… seems to be the usual for things at Kohl’s! I had heard that LC was launching a runway collection but in the time I spent admiring all my usual designer faves new stuff it completely slipped my mind. Now I think I may need to check it out because some of these pieces are beautiful and would fit perfectly in my style and be able to wear for work too. Yay, so glad to hear that! I definitely was pleased with the collection overall and like you said, so many work appropriate tops! I love that fringe top and the owl romper! You looked great in everything! I am obsessed with Lauren Conrad and felt so excited when I found out she was going to have a show at Fashion Week, It’s like she is my friend in real life haha. I haven’t bought anything from the collection yet, but I have my eye on some of the pieces. Haha! I know what you mean Macy, I felt the same way! Probably all those years of following her on Laguna Beach and the Hills. I absolutely love this collection – every single piece! Lovely photos! Wow I really like a lot of her stuff! Very cute styles! I may have to check some of it out for myself. 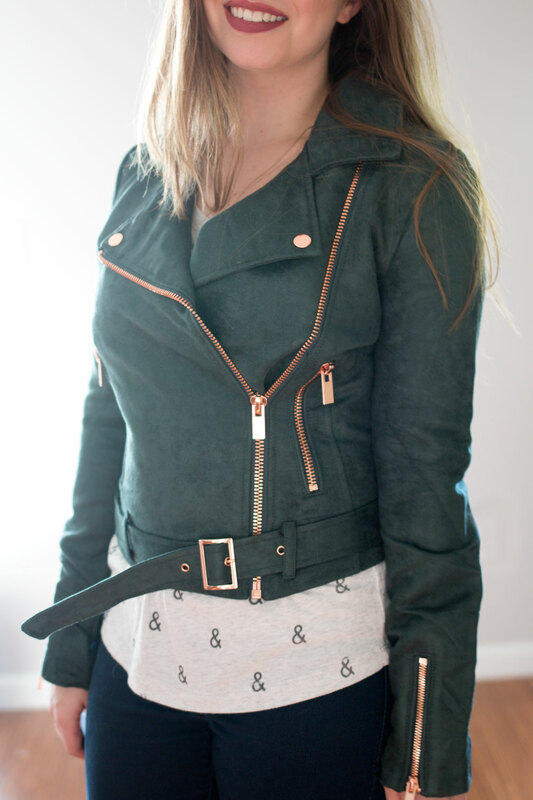 I am IN LOVE with that green suede jacket! I’m actually glad it’s sold out because I’m trying not to spend. I’d also be tempted by that lace romper for my rehearsal dinner if I didn’t already have a dress for the occasion! Ha, I’m glad for your sake it’s sold out too! I would have been tempted to reorder it in the next size up if it was still available because I love the color! This whole collection is so cute! I could have kept so much in this. I agree, the owl romper is frickin’ adorable (especially with that shade of lipstick you are rocking). I actually think the pintuck tie neck top is also pretty cute, since it’s a fairly low maintenance top that still looks feminine and a little dressy. Aw thanks Cat! I like it too, I’m tempted to keep it but I think I may wait for it to drop in price a bit more since I don’t need it, ya know? I also watched the runway show online and it is great to see and hear how the pieces fit in real life. I think it’s definitely worth a shot! I was impressed overall with the line, a lot of cute pieces even if they didn’t 100% work out for me. 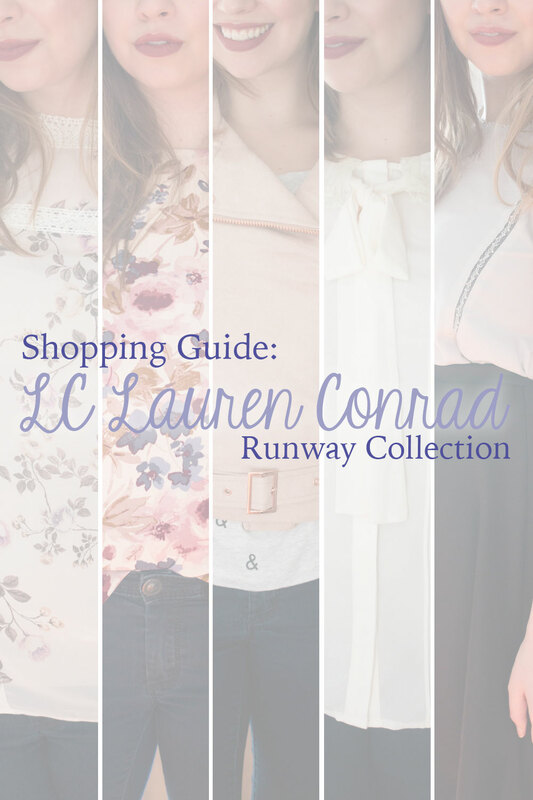 I’m always so curious about the LC by Lauren Conrad collection at Kohl’s! I purchased a blazer from the first ever release, but wasn’t so into the quality of fabric – as you mentioned in many of your item reviews. I’m loving the lace trim blouse and the bow sleeve crepe top. The patterns are just so sweet! Both rompers look amazing on you – I don’t think I’d be able to pull them off! Ohhh that green jacket is so pretty! I’ve been loving any of the tie tops lately and love the white/cream one. I sometimes feel like Kohls (or maybe just this line?) is on the expensive side for the quality, but I guess it’s one of those places that you have to know how to shop the sales / use coupons? Love the LC Lauren Conrad collection at Kohls, I have been fairly disappointed with the sizing lately though. Nothing seems to fit up top, or it’s too boxy. Glad you found some pieces you liked, that last floral top I might just have to order. It looks great on you! Thanks Leanna! I think you’d like that one – I found it to fit well across the chest without being overly boxy in my normal size. Agree with you on the sizing, it seems inconsistent across the entire line. Yep, I totally feel ya on that problem. I think the dress and moto jacket could definitely work though – I did try the size up in the moto jacket on in store for reference and it still looked good! The owl romper and last top are definitely my favorites!!! Love!! Thanks Meg! I love both of those too! The romper is adorable on you! I love it! And I also love the Lace-Trim Blouse, but if it’s tight in the chest, it probably wouldn’t work for me! i love the idea of LC’s stuff, but it legit never works on me. it’s always too short or awkward. 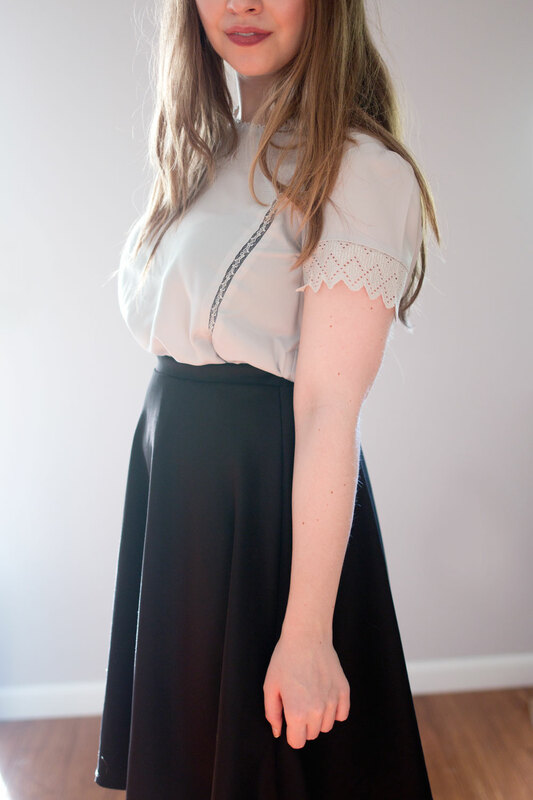 but she makes some super pretty clothes, like that lace trim top! The owl romper is super cute! Thanks Rachel! It was by far my favorite piece. That romper!!!! Wawaweewa!! The color and style look incredible on you Jenn! 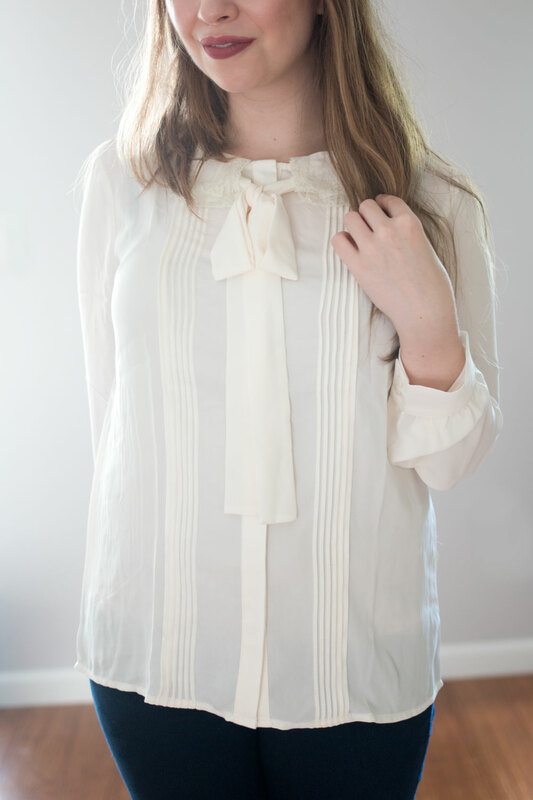 I’m also loving the soft and feminine pintuck tie neck blouse. The lace collar is such a pretty touch! Ha! Thanks Rita! I’m loving it too, and agreed, the lace collar is a beautiful detail! I kept hearing how the moto jacket runs small, but I couldn’t find these in my Kohl’s store, i feel icky ordering these online because I don’t know what size to order. 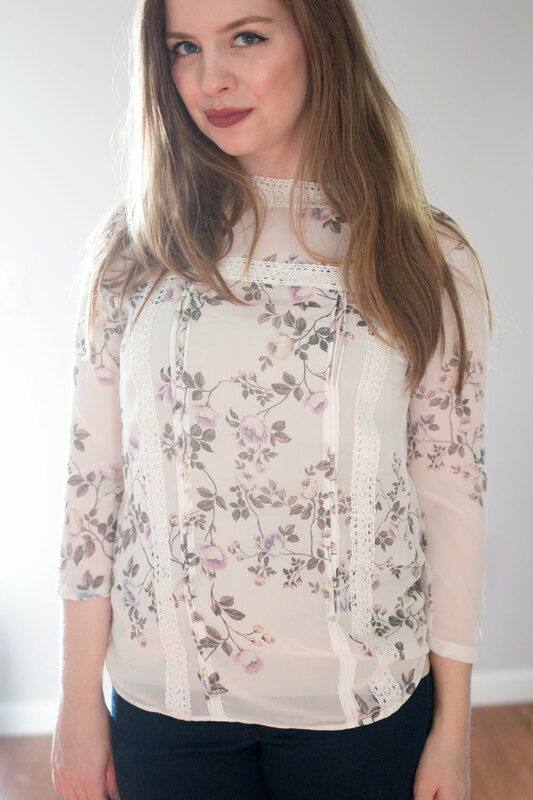 I bought Lace-Trim Blouse in XXL today and it fits really loose, and I fit most of its items in Large, but some are smaller than others. Any recommendations for sizing on the MOTO jacket and Ruffle Organza Dress? Totally depends on your bust size, as both items for me ran small in that area. The jacket also runs a bit tight in the shoulders in my opinion. I normally wear a size small in her line, with the occasional exception on items that are a bit more fitted across the chest. I would recommend going one size up in the jacket, in the dress I think you’d be safe in your normal size, unlike your bust is larger than average. If you don’t have it in your store, you might want to grab your normal size and the size up and just return whichever doesn’t work. They have always been amazing with returns for me, which is why I don’t hesitate to order multiple sizes often! Hope that helps. That’s such a great post! I was thinking to buy a couple of pieces from LC collection, but was not sure how those would fit. Thanks for great honest reviews! Of course, Katya! So glad it was helpful! 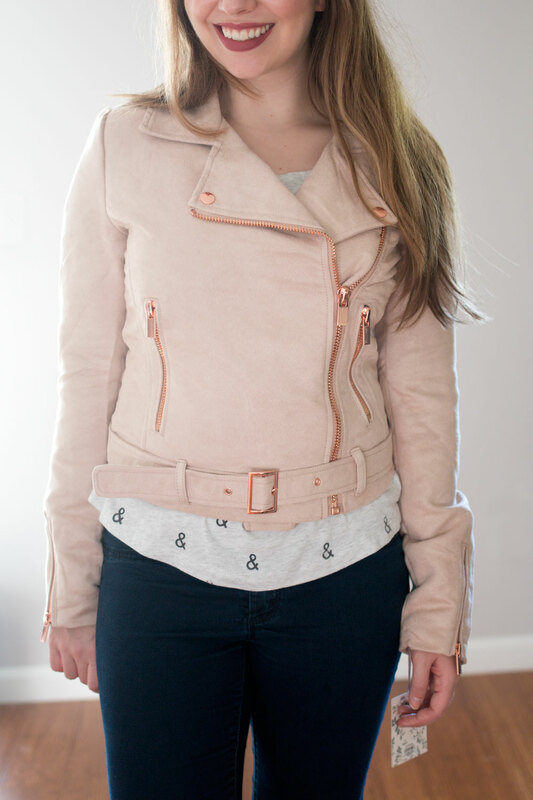 Would you be willing to sell me the Lauren Conrad evergreen moto jacket?!? Please email me and let me know! !